Writing in the journal Emerging Microbes and Infections, a team led by Tony Goldberg, a University of Wisconsin-Madison professor in the School of Veterinary Medicine and an expert on emerging pathogens in animals, describes two simultaneous outbreaks of respiratory illness in chimpanzees in the wild, one of which was lethal. 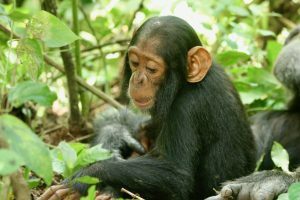 One group, consisting of 205 chimpanzees known as the Ngogo community in Uganda’s Kibale National Park, was especially hard hit, with almost 44 percent of animals suffering from respiratory illness. Twenty-five chimps in the Ngogo group died during the outbreak. The other group of chimpanzees, known as the Kanyawara community and consisting of 55 animals, experienced an outbreak where a little more than 69 percent of animals were affected by respiratory illness. In contrast to the Ngogo group, no animals from the Kanyawara community died of the disease. A deceased individual from the Ngogo group, a 20-year-old female, showed evidence of sudden viral illness. A 22-year-old female chimp from the Kanyawara community had been ill but was recovering when she was killed by members of her group for unknown reasons. Her body showed evidence of a more prolonged disease course. Parainfluenza virus 3 is a common cause of croup in preschool children. In people, metapneumovirus is a common cause of wheezing illnesses in infants. A group led by Goldberg was also the first to identify another human cold virus infecting and killing chimps in Uganda in late 2013 – rhinovirus C.
Although people are the sources of these viruses, it is not clear how they are getting into chimps.